The firm sent us this letter and it had some very interesting data on Market cap to GDP for India, which we have never seen before, so check it out below and tell us what you think. 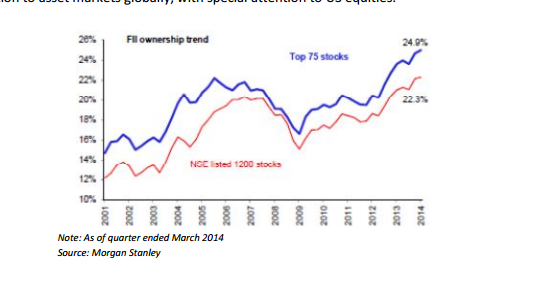 Avant Garde Wealth Management quarterly investor letter 2014; bullish case for India. The past six months have seen a significant rally in global equities, with India being a top performer thanks to the election of the BJP government and consequent expectation of a significant economic turnaround. While economic growth in India may improve in the coming years, in this letter we consider what that may mean for future returns from Indian equities. Globally, buoyancy in asset markets is accompanied by record levels of complacency, which raises the possibility of prices being overextended. Indian equity markets have rallied about 25% in the past six months, ranking among the top performers globally. This rally has been supported by the election of a new government in India, which is led by Prime Minister Narendra Modi of the BJP. There is widespread expectation that Mr. Modi will transform India’s economy. Corporate managements are gearing up for stronger growth and financial experts of all stripes have unanimously declared that India has embarked on a multiyear bull market. In our Sep 2013 letter we argued that earnings growth of Indian companies would possibly remain weak for a few more quarters, but eventually accelerate over a three year horizon led by a pickup in the investment cycle. Given the sharp improvement in business sentiment and to the extent that the new government implements good policies, the pickup in earnings growth may come a bit sooner than expected and the degree of improvement could possibly be larger. However, despite the current overwhelmingly positive mood, the future is by definition uncertain given the significant number of variables involved. Even if policy making is able to encourage productivity growth, there may be extraneous factors that limit or magnify the actual eventual impact on economic growth and corporate earnings. Below is a time series of India’s market cap to GDP ratio. Ascertaining the appropriate fair value level for this ratio is to some extent a subjective exercise since the history is not long enough and the variation very large. However, a few points are noteworthy about the current level of 83%. 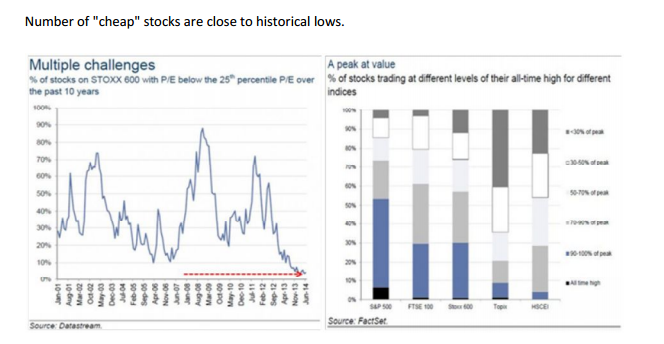 It is (1) Well above the low of close to 20% reached in the early 2000’s, (2) About one standard deviation above the historic average of 62%, (3) Significantly below the high of more than 160% reached at the bull market peak in early 2008, (4) Lower than the high of 107% reached in October 2010, and (5) During the 2003 to 2007 bull market the ratio only hit 83% in March 2006, by which time the bull run was in its later stages. Another way to use the market cap to GDP ratio is to map it against subsequent index returns over various time periods. Once again, the short history of the data makes this analysis only part informative. The previous chart shows a fairly tight correlation between the market cap to GDP ratio and subsequent 10-yr index returns. Based on this metric future 10 year market cap CAGR can be expected to be in the range of 0-5%. In our Sep 2013 letter we pointed out that movements in Indian equities are correlated with the S&P500, especially during large draw downs. We believe that FIIs (Foreign Institutional Investors) have been the marginal price setters in the Indian equity market for some time now. A material decline in the risk appetite of foreign investors, which would probably accompany any significant fall in the S&P500 Index, would impact Indian equities negatively. Hence we pay reasonably close attention to asset markets globally, with special attention to US equities. See full Avant Garde Wealth Management – Bullish Case for India in PDF format here.